Below is an email I sent to County Executive Alan McCarthy and members of his administration on 3/28/19, prior to the announcement of his proposed budget for FY 2020. For too long, Cecil County has been willing to accept “OK,” as an assessment for many things in our community. It’s time we acknowledge that “OK is not enough,” especially when it comes to funding our schools. And more important than merely acknowledging that we are not willing to “settle,” it’s time our county budget reflects the priorities of our citizens. County officials profess a desire to increase the number of residents who attain at least a bachelor’s degree yet the county’s track record for investing in education says otherwise. 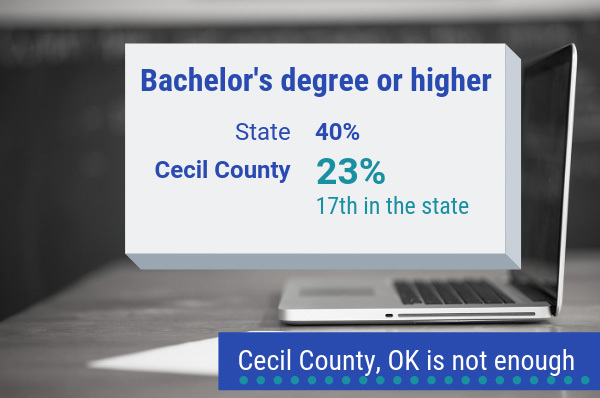 In the state of Maryland, 39% of residents have earned at least a bachelor’s degree; Cecil County, in comparison, has one of the lowest rates in the state at just 23%, ranking 17th out of 24. 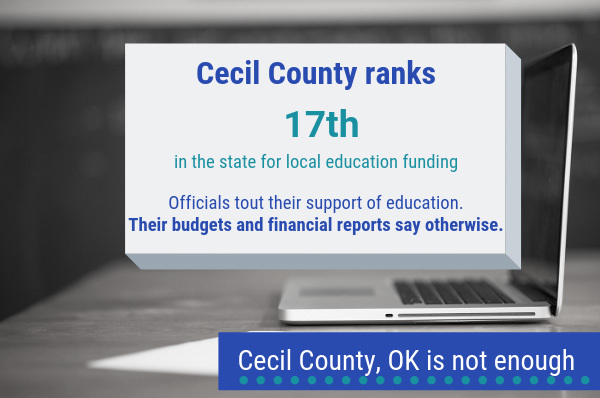 That fact shouldn’t be shocking when the county also ranks 17th for local funding of education. How far does local funding from Cecil County lag behind much of the state? In FY 2019, the county spent $5,616 per student on education, $1,891 per student less than the state rate per student–with an enrollment of 14,800 students, that’s almost $28 million less…in one year. Every year the county funds the schools at or near the maintenance of effort, the minimum permitted by state law, all the while treating the requirement to fund the school system as an unreasonable demand. During the period immediately following the recession, such under-funding might have been understandable but, more than a decade later, this is no longer acceptable. I find the current state of the county’s finances particularly infuriating because I vocally supported the tax increases that were introduced with the FY 2018 budget, foolishly expecting that some of that additional revenue would be spent on our schools. Instead, the county raised $14 million in additional taxes in one year but only increased its appropriation to education in that year by $1.1 million and in the current year by $800,000. (And just for good measure, I added) P.S. Reminder: Perryville High School is still waiting for a field house–over 40 years after the school opened. 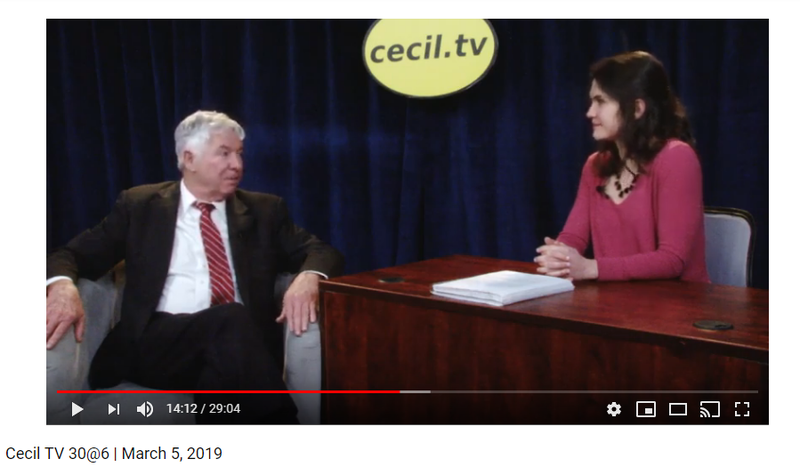 Last week Cecil County Executive Alan McCarthy sat down for an interview with Cecil TV that should’ve shocked the county’s education advocates. Unfortunately, only a few of us have seen it. I didn’t share it on social media because additional facts needed to be included. [10:34] Cecil TV: So, Cecil County Public Schools is seeking a $6.4 million increase over their FYI 19 budget allocation and, and they’ve said that they would need more like 30 million to be on par with the state averages as far as per pupil funding and declining enrollment and increased wealth in the county will likely lead to less and less money coming from the state. How are we going to keep up? [11:04] McCarthy: The only way that we can keep up is basically for the county to find ways to generate new revenue. One of the problems is we brought lots of new businesses in, but because they’re in an enterprise zone, they do not generate the tax revenue which they really will anticipate after their time in the enterprise zone is basically expanded. For example, if you were to make a capital contribution wherever you do to improve the property, the county only collects 20% of that the first five years. That’s 25% 20%, per year for five years. And then we get 30%, 40%, 50% in a decreasing scale for them but beneficial for us. Right now we’re in the infancy of this program. So our revenues are not nearly what they will be in a brief 10 year time period. [11:52] McCarthy: So, without that I don’t really know how we can get more revenue for the public schools because they’re growing their expenses at a far greater rate that we can grow the revenues. [12:00] McCarthy: Right, even though they’ve tried to slash funding for example this year we’re basically flat, in terms of revenue. Last year we basically had three or four businesses that refinanced which basically provided to us about $3 million in extra revenue but there’s no guarantee and we can’t count on those things happening every year. So this year we’ll basically will have to flat fund them. I’m going to provide them as much money as I can, but I don’t think it’s going to be anywhere near $6.4, million. [12:46] Cecil TV: How do you think that they will do it? [14:48] McCarthy: I think it will be more aligned with me. I can’t promise what they’re going to do, but I would think that they would…a six point, but it was a 7.6% increase is a huge, huge increase and I mean I can understand your needs, I can their wants. 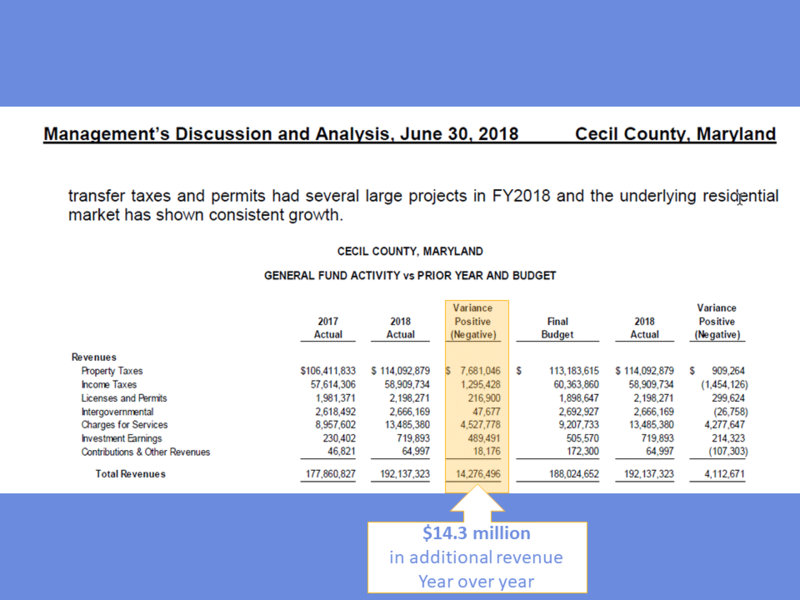 But once again, we have to maintain a balanced budget and the money is just not there without basically totally cannibalizing other departments in Cecil County government. Did he forget about the tax increase? Granted, that $13.8 million was included in the FY 2018 budget so they might not consider it “extra revenue,” but it is extra revenue all the same. Where is that $13 million? Somehow county officials keep “forgetting” to tell us where that additional tax revenue is going. It never seems to come up–it wasn’t mentioned at the county town hall on the budget or in this interview and I haven’t read about it anywhere. You think they’d be doing backflips to have the additional funds and shouting from the rooftops that they can finally restore funding to county departments, including the board of education. But it was never mentioned. Again, where is that additional tax revenue? Is it in the county’s fund balance that we’ve heard so much about? And education is going to be “flat funded” in the second year of the tax increase?!? 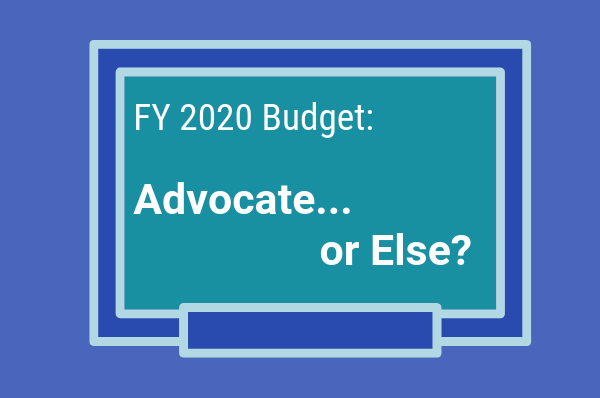 Email County Executive Alan McCarthy at amccarthy@ccgov.org and Director of Administration Al Wein at awein@ccgov.org and tell them you want adequate education funding in the FY 2020 budget. While you’re there, ask them if they’re up to date on the Kirwan Commission and its requirements for local education funding. Failure to fund specific initiatives like teacher salary increases and pre-K for all 4 year olds will mean the county leaves state grant money on the table. What about those tax increases? If we wait, it will be too late! Note: The articles on this website are my opinion based on my research and observations. I am not employed by Cecil County Public Schools. County Executive Alan McCarthy took office in November of 2017 and I was hopeful that education funding in Cecil County would increase to adequate levels. And I supported those tax increases–because I wanted to see Cecil County Public Schools finally receive appropriate funding. 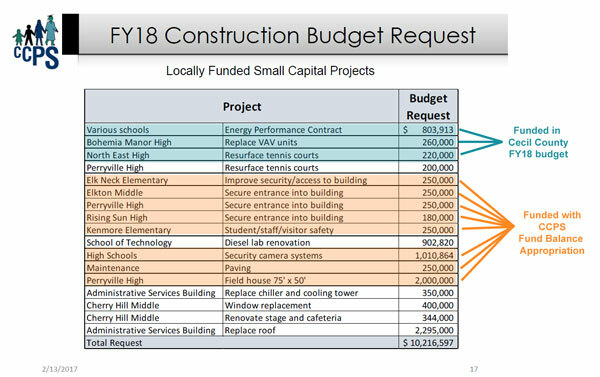 That budget included a meager 1.34% increase in funding for the Cecil County Public Schools operating budget and hardly anything for the long list of projects on the small capital request. To use a sports analogy, I considered it a rebuilding year. Ah, fund balance, we’re always talking about fund balance. Yes, unfortunately, we are–again. Last February there was heated debate about the Cecil County Public Schools fund balance. In this case, CCPS was asking permission from the county to spend part of its fund balance on several long-needed projects, including a field house at Perryville High School (they’ve only waited 42 years). The county wasn’t funding those projects so CCPS wanted to use some of its savings to cover the costs. 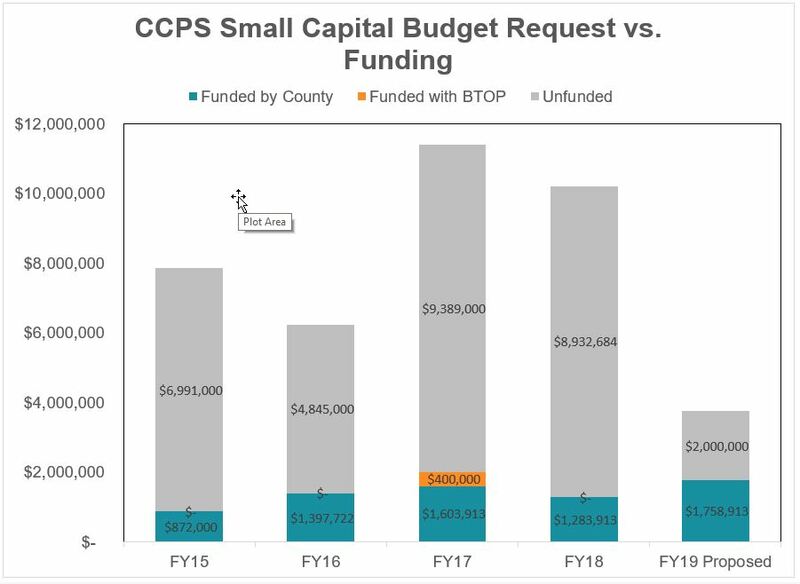 Most of this became a moot point when CCPS was forced to use $1.4 million of its fund balance to cover the FY2019 operating budget that the county didn’t fully fund and the FY 2018 fiscal year came to a close. In August the county decided to release some of the money they’d had in reserve pending the decision on a state court case. And, lucky day, they wanted to spend $1.0 million of that money to fund school entrance upgrades. First, they wanted to torture CCPS over their fund balance again…and add strings to the funding. The county would appropriate the money but only if CCPS agreed to spend their fund balance on additional school entrances. Despite the drama, the funding was eventually approved in September. 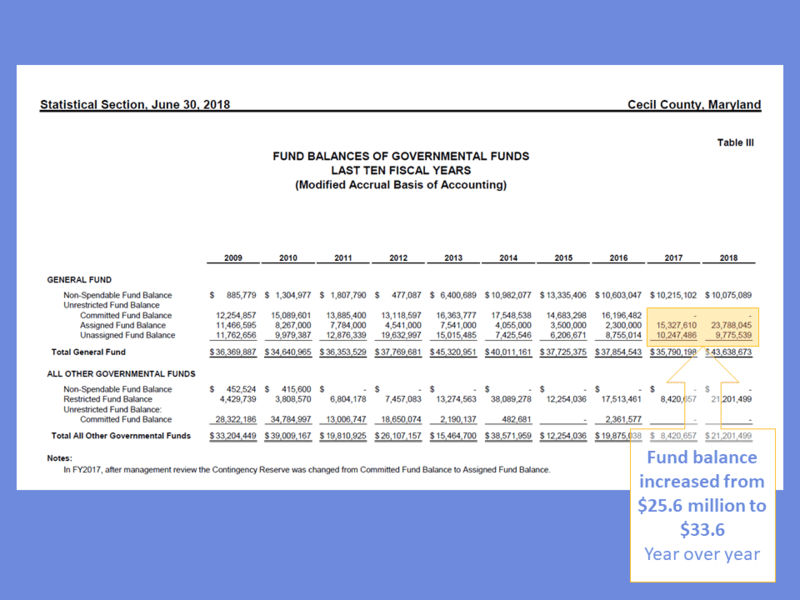 All the talk about fund balances got me thinking–how much money is in the county’s fund balance? S&P, the bond rating agency, noted that the county’s available fund balance was $25.6 million at the end of FY 2017. 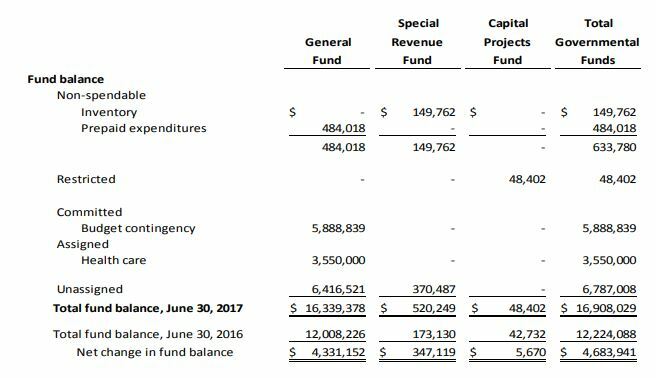 If you compare those same lines at the end of FY 2018, the available fund balance was $33.6 million. That’s an increase of $8.0 million in one year. We could get into a discussion about complicated terms like Assigned Fund Balance vs. Unassigned Fund Balance but I look at it as different pockets in the same pair of pants. S&P pointed to the sum of those two lines so that’s what I’m comparing. But what about those tax increases? That adds up to a $13.4 million increase in revenue. The county executive’s public input session on the FY 2020 budget earlier this month led off with a “budget preview.” That presentation was much like the ones I’d seen before–the state took highway user funds from local governments to the tune of $5-6 million a year, expenses are up, the local economy hasn’t rebounded as projected, etc. I don’t recall any mention of increased revenue but maybe I missed it. 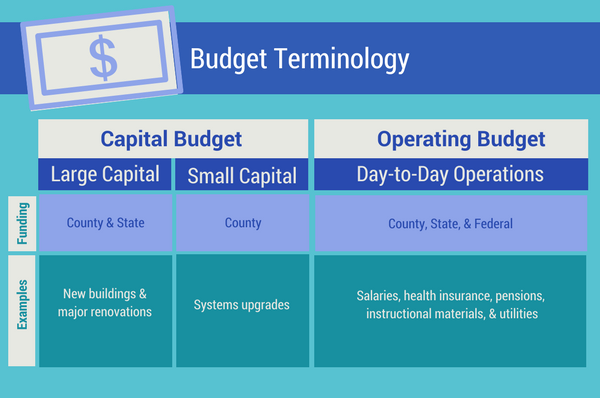 The FY 2020 budget currently proposed by CCPS is once again bare bones. Even though it comes with a price tag that is $6.4 million over last year’s budget, $4.1 million of that amount is cost of living and step increases for employees. The state informed Cecil County that its constant yield rate increased slightly which could mean a slight decrease in property tax rates. County officials were quoted in the Cecil Whig as citing the proposed CCPS budget increase as one reason that rate shouldn’t be reduced. Throwing CCPS under the bus in the press again? So early in the budget season? The actors may have changed but the plot remains the same. That leaves me to ask–what is being done with that additional revenue? I supported a tax increase because I evidently foolishly believed the funds would lead to an increase in education funding but I’ve neither seen nor heard anything that demonstrates that to be the reality. This increased revenue isn’t an anomaly. According to the monthly financials posted on the county website, as of 11/30/18, the county continues to see that revenue. The perennial question has been “Where does the casino money go?” (and we can talk about that later) Maybe we also need to ask where the tax revenue goes and we need to ask that question of the people who are responsible for it instead of just asking each other in passing. The county executive will present his proposed budget for FY 2020 on March 29. Once the county council receives the budget, nothing can be added (the council can increase the budget for education but that increase has to come from some other place in the budget). I encourage you to email the county executive and his administration during this crucial period of budget preparation and tell them you expect that budget to include adequate funding for CCPS. To share your support of the budget or to advocate for specific parts of the budget, email County Executive Alan McCarthy at amccarthy@ccgov.org and Director of Administration Mr. Al Wein at awein@ccgov.org. Note: the agenda for the March 5, 2019 Cecil County Council legislative session includes the introduction of a new bill regarding the county’s fund balance. Here’s link to the bill and the appendix. Now is the time of year to advocate for education funding in Cecil County and, in order for your advocacy to be most effective, you need to understand some steps in the process. But many decisions for the coming year are being made NOW! Superintendent and board discuss any changes that may be necessary. Superintendent presents his final budget to the county executive. Once County Executive Alan McCarthy presents the budget to the county council, nothing can be added (the council can increase the budget for education but that increase has to come from some other place in the budget). Our job is to let the county executive know that we support increased education funding in Cecil County. He’s an elected official and, while he hasn’t announced plans to run for a second term, that’s certainly a possibility. We will either support him during the election or hold him accountable for his budgetary decisions. The final budget request from CCPS will come with a higher price tag than recent budgets and that number is the minimum the school system needs. In recent years, the county has funded CCPS at either the minimum level permitted by state law (called maintenance of effort) or just slightly above. I haven’t even mentioned the capital budget yet. Your mission, if you accept it, is to contact the county executive NOW. It is our only chance at getting the necessary funding. To share your support of the budget or to advocate for specific parts of the budget, you can email County Executive Dr. Alan McCarthy at amccarthy@ccgov.org and Director of Administration Mr. Al Wein at awein@ccgov.org. 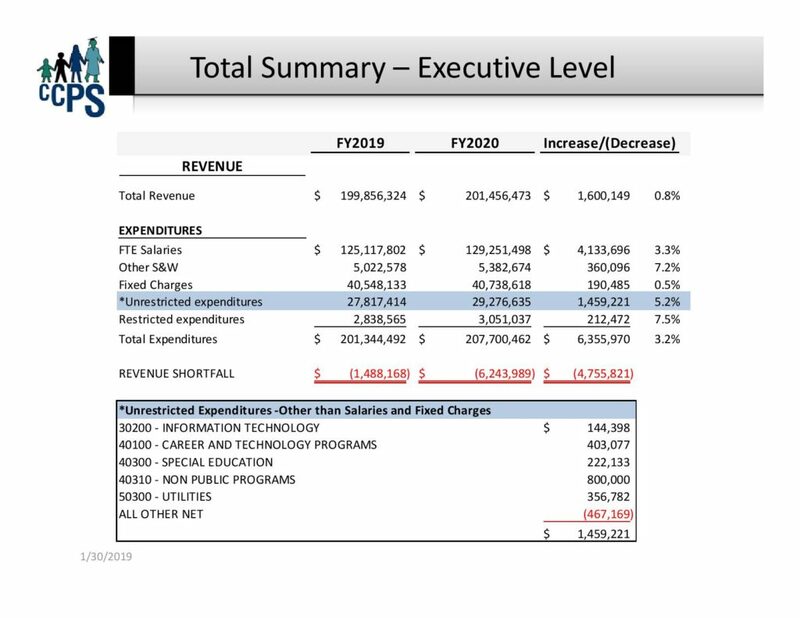 I’ll be posting more detail as the budget develops but the short story is the proposed operating budget for FY 2020 is an increase of $6.4 million over the FY 2019 budget. While opponents distort the data any way they can in order to inflame the uninformed, the reality is pretty straight forward. Salaries–$4.1 million–Employee cost of living (COLAs) and step increases stipulated in the county’s contracts with various employee groups (teachers, support staff, etc.). Cecil County Public Schools is the second largest employer in Cecil County (only WL Gore employs more people) with just over 2,000 employees, many of whom are county residents so much of that money gets spent within the county. CCPS honored those contracts during the darkest days of the recession in order to maintain the quality of its workforce and reduce the number of employees defecting to neighboring school systems. 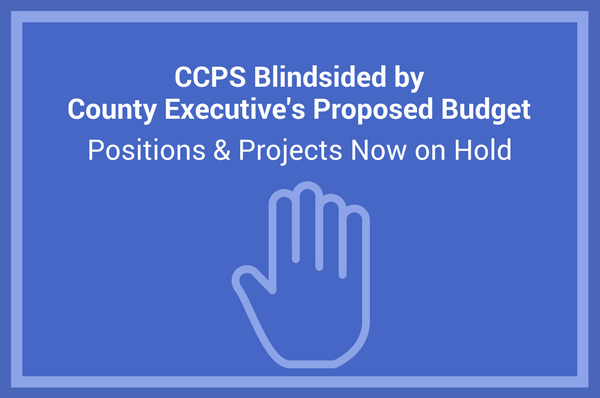 When funding suddenly dried up in 2009 and hard decisions had to be made, CCPS opted to cut over 150 positions in order to continue providing increases for remaining employees. Everything else–Even with cuts across various departments, including some cuts that are substantial, and overly optimistic (my words) projected savings, the proposed budget requires additional funding. $360,000–Other salaries & wages–this includes substitute teachers, overtime, and similar expenses. $800,000–Non-public school programs–Cecil County is required by state law to provide an appropriate education for all students and if the public school system can’t provide the education services students require, the county must pay for those students to attend private schools that provide the necessary services. $400,000–Diesel Program at CCST–Supplies and materials need to be purchased in order to begin offering the diesel technician program at Cecil County School of Technology. I’ve seen a lot of interest in this program since it was announced a few months ago but without this funding and an additional $200,000 in capital funding for the necessary building renovations at CCST, I don’t see how it will happen this fall. $330,000–Utilities–Summer heat that extended into the fall meant more air conditioning and the overall cost of fuel is projected to increase. I could and will go into more detail in future posts but that’s the budget in a nutshell. Update 3/15/19: CCPS released the video below about the budget. For those posting comments along the lines of “The schools need to tighten their belts” and find the money for these increases in the funding they already receive, while your insight is helpful ANY FAT WAS CUT FROM THE BUDGET YEARS AGO. Now we’re cutting into the meat. Citizens: if you want CCPS to retain and attract quality teachers and staff and/or if you want to see a new diesel program introduced at CCST, you’ll need to advocate for this budget. 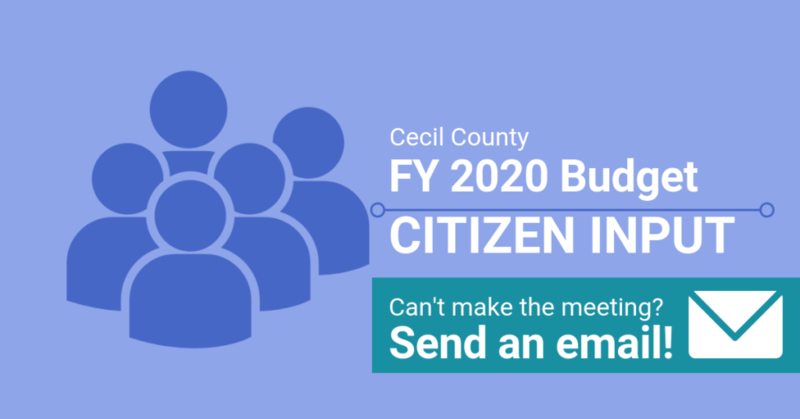 Employees: you know better than I do which school systems have not given increases in recent years or are considering that option as part of their FY 2020 budgets, the county needs to hear from you or that could become a reality in Cecil County (again, my words). With 2,000 employees, your collective voices would drown out the squawking of the few persistent malcontents but the county has to hear from YOU. February 12 – County Executive Public Hearing (Citizen Input) 6:00 p.m.
February 20 – Board of Education Budget Hearing, 6:00 p.m.
March 11 ‐ Board Approval of Proposed Budget, 6:00 p.m.
June 10 ‐ Board Approval of the Budget, 6:00 p.m. If we wait to advocate until County Executive Alan McCarthy submits his budget to the County Council, we’ll be too late. 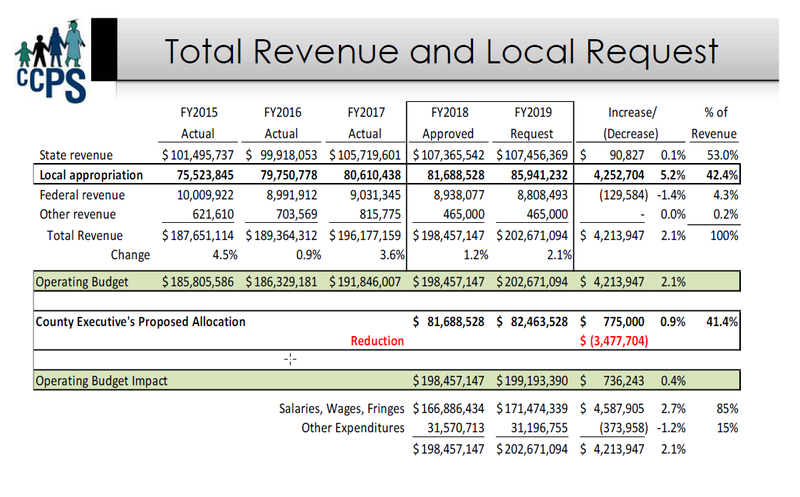 At that point, council can only approve the budget or cut it (they can increase education funding but any increase has to be offset by a decrease somewhere else). Tonight the Cecil County Council will host its annual public budget hearing at Elkton High School. We will see many familiar faces as the usual contingents show up in support of their particular causes–Cecil County Public Library, Cecil County Public Schools, Cecil College, various public safety organizations–and many of us will say essentially the same things we’ve said in previous years. But there’s always a group that speaks against any funding that doesn’t directly benefit them and they will tell some tall tales. Last year they got up one after the other and told the council how people were moving from Cecil County to Delaware because the proposed tax increase was too high. I don’t follow Delaware taxes closely but I seriously doubted their claims were based on facts. One thing the speakers overlooked was the fact that school districts in Delaware have taxing authority, a funding source Cecil County Public Schools doesn’t have. The Appoquinimink School District Board of Education has approved a 13.8 percent property tax increase and approved a budget which runs a deficit and cuts programs. At the same meeting on July 11, the board also approved the designs of the new elementary school and another new building containing a middle school and high school. Effective immediately, the property tax rate will increase by about 25 cents from $1.8473 to $2.1024 per $100 assessed value. District officials have delivered the tax warrant—which lists the new rate–to the New Castle County government. The property tax bills should be mailed out by the end of this month. Delaware does have some tax benefits but it’s far from a mass exodus and the speakers didn’t present any data to support their assertions. Based on some of the messages I’ve seen repeated online from this same cast of characters, let’s put out a few facts in advance of the hearing. 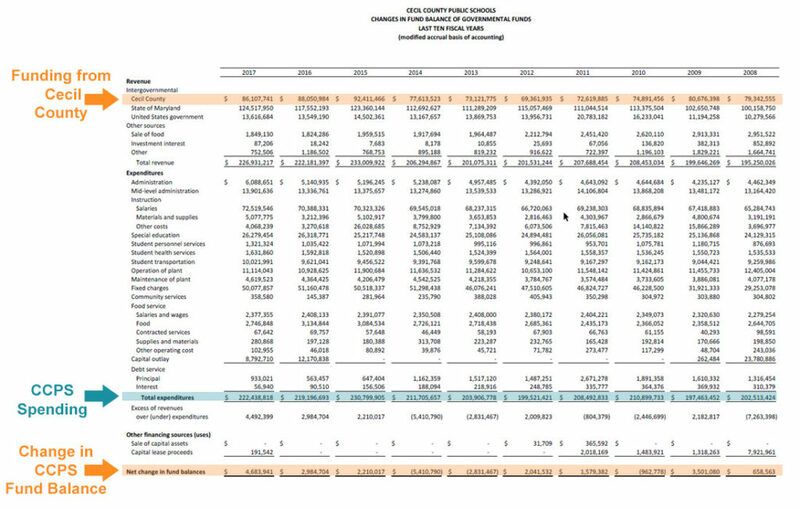 Yes, Cecil County Public Schools did end FY17 with a fund balance of $16 million, however, it’s not as if the school system is sitting on a pile of cash that it can spend any way it wants. The use of much of that money is restricted either by board policy (the $5.9 million identified below as “Budget Contingency”) or government accounting standards. The qualifications for the positions are very different. There are no requirements around higher education or work experience–just age and residency requirements. Heck, most of us in the room for the budget hearing will meet these requirements. While most superintendents meet the requirements to run for governor, current and previous governors don’t meet the requirements to run a school system. At the budget hearing, there will be only a few in attendance who meet these requirements. I’ll say it again: Not everything you read online (or hear people say) is true. Choose your sources of information wisely and only share the truth. 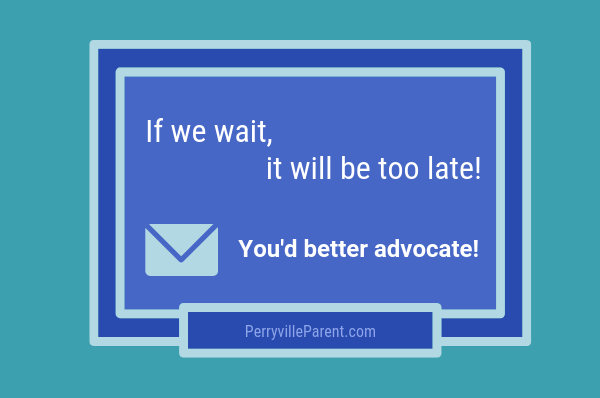 What Can You Do to Advocate for Education? How did CCPS end up with an extra $6.4 million to spend? If your only source of information on education in Cecil County is what you read in uninformed rants online and in the letters to the editor you could get the idea that CCPS was up to something shady. 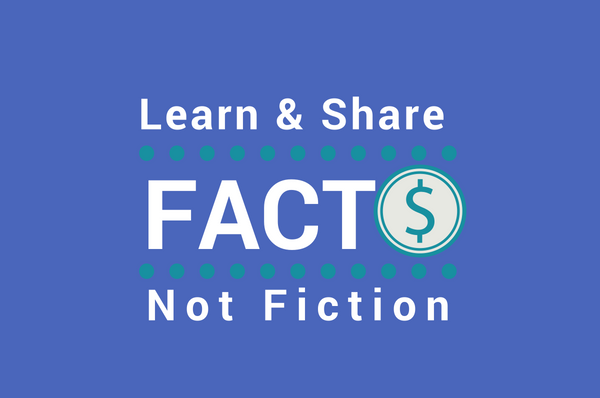 But if you read the actual articles in the paper or *gasp* attend a board of education meeting (here’s a link to the meeting schedule), you’d quickly realize those other less-than-reliable “sources” are telling tall tales. The real answer to the question about fund balance couldn’t be farther from shady. That $6.4 million is the measurable, tangible result of the school system’s efforts to control costs and generally function as trustworthy stewards of the taxpayers’ investment in public education. CCPS has saved the county literally millions of dollars in the last decade by developing and maintaining a culture of efficiency and frugality. Cost saving Initiatives like installing multiple large solar energy arrays, switching utilities from oil to natural gas when feasible, and adjusting employee health insurance plans, combined with several winters of weather less severe than 2014’s Polar Vortex, all contributed to the favorable unassigned fund balance CCPS reported at the end of the 2017 fiscal year. 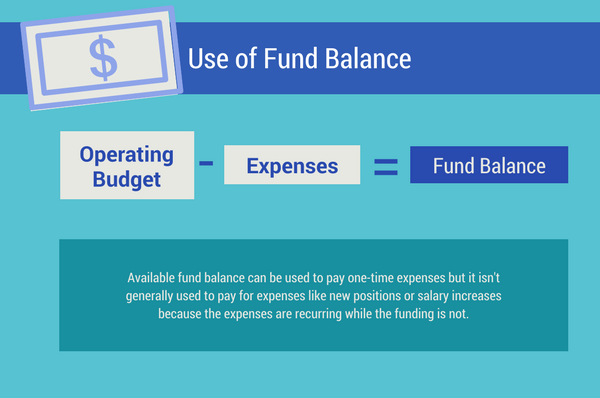 Fund balance is a term most of us don’t run into in our daily lives but it’s an important concept to understand when talking about school budgets. My admittedly oversimplified definition of fund balance–it’s the money remaining in the operating budget after all other expenses have been met. The fund balance of the Board of Education of Cecil County has been accumulated to meet this purpose, to provide stability and flexibility to respond to unexpected adversity and/or opportunities. The target is to maintain a total fund balance of not less than 5% of annual operating expenditures for the fiscal year. -This amount provides the liquidity necessary to accommodate the Board’s uneven cash flow. -This amount provides the liquidity to respond to contingent liabilities. That $6.4 million is from the unassigned balance that remained at the end of FY2017. 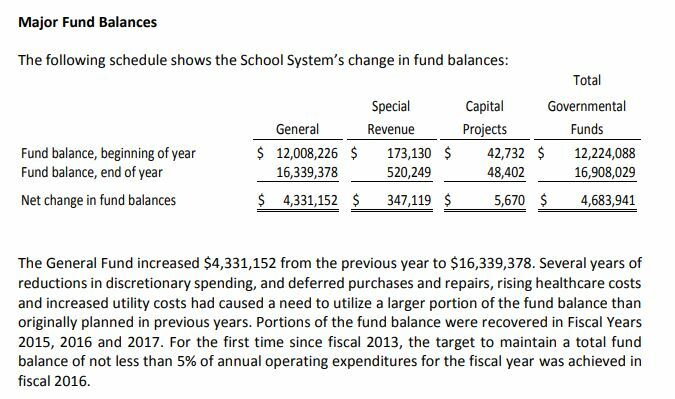 This screenshot from the CCPS Annual Report for FY17 gives you a better perspective on the county’s funding of the school system vs. the net change in the CCPS fund balance. For good measure, the green line shows CCPS spending. Why did CCPS decide to use fund balance to pay for the field house at Perryville High School rather than putting it through the county’s capital improvement plan (CIP)? They tried (and tried…and tried) to get the county to pay for the project. It’s been included in the school system’s capital request for at least the last four years. In fact, when I started advocating for the school system 4 years ago, I was told the school system includes the field house in every year’s budget request because, in the past, some county officials claimed that they didn’t know about the project or forgot about the project from year to year. Even when there has been no chance in hell that the project would be funded, it was listed in the budget request as a sign that CCPS hadn’t “forgotten” about the project and wasn’t letting the county forget it either. But there’s always someone who seems surprised when the topic comes up. Anyway, when the new building at Perryville High School opened in 1977 a field house wasn’t included in the project. I’m not sure if that was due to a lack of funding or if field houses just weren’t considered common and necessary at the time. Regardless, in the last 40 years, field houses were built at all the other high schools in the county but Perryville never got one. So, after 40 years of waiting and with no sign Cecil County would ever pay for the field house, CCPS decided to fund the project itself, using the money it had saved from cost-cutting measures over the last few years. Maybe the county will fund the field house in future capital budgets? 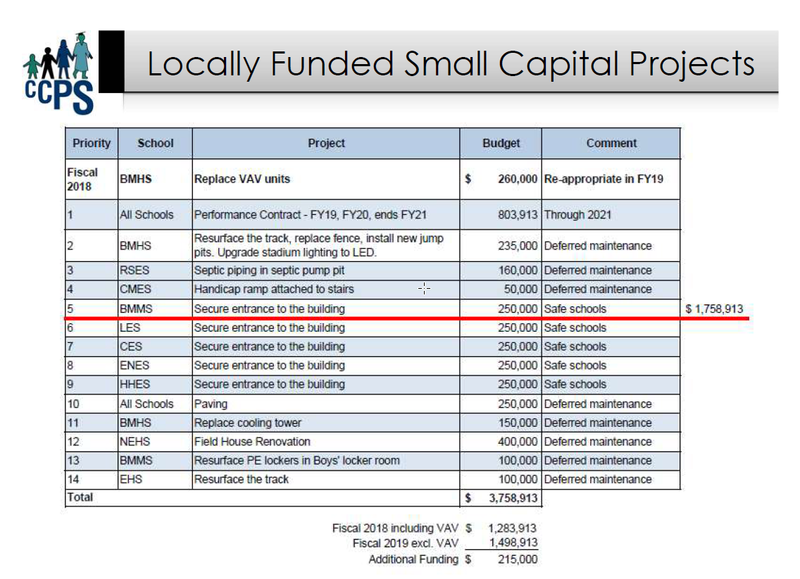 For more than a decade, Cecil County has had a lousy track record for funding small capital projects for CCPS and, despite the best efforts of the maintenance staff, some of the damage caused by this neglect is visible in our schools. As I told the council when I spoke in support of the budget amendment that addressed the appropriation of the fund balance, the most the county has funded for the CCPS small capital request in the last four fiscal years is $1.6 million and $800,000 of each year’s funding was the payment of a multi year contract that the county was obligated to pay. With that kind of history, you can see why I told the council I had little hope of the county ever coming up with $2 million for the field house project. How is CCPS spending the rest of the fund balance? Because the accumulation of unassigned fund balance doesn’t represent ongoing sustained funding, it wouldn’t be prudent to spend the money on recurring expenses like salary increases or new positions. If the money was spent on pay raises this year, what would happen in the next fiscal year when that funding wasn’t available? If the county opted not to fund the increased salary expense, employees would then have to take a pay cut and no one wants to do that. Sound financial management means the fund balance should be spent on projects and one-time expenses. Following those guidelines, most of the projects that will be covered with this money have appeared as part of the CCPS budget requests for one or more recent years–but not funded by the county. 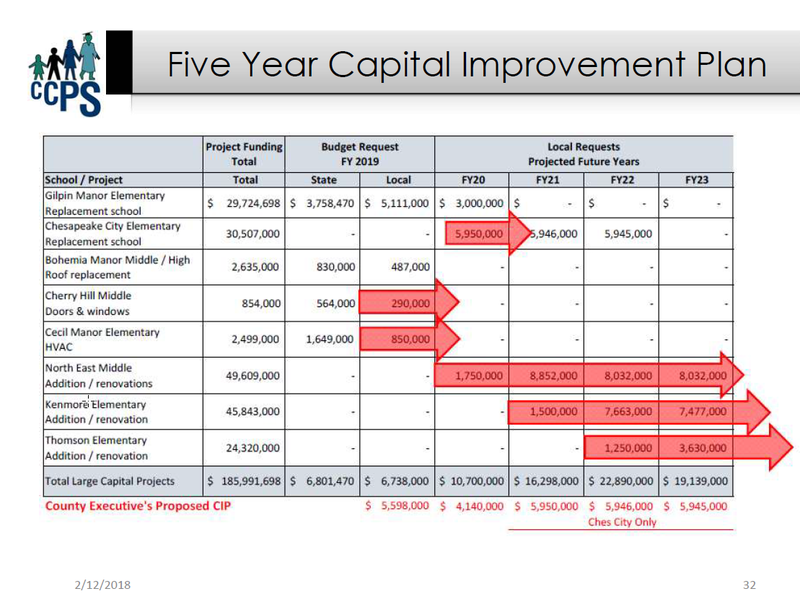 To put it in simply: CCPS plans to use the savings from its operating budget to cover capital projects that would otherwise have to be funded by the county. We should be thanking CCPS for taking care of these projects because the county had no plan to fund them in the near (or distant) future. What about the security of school entrances? 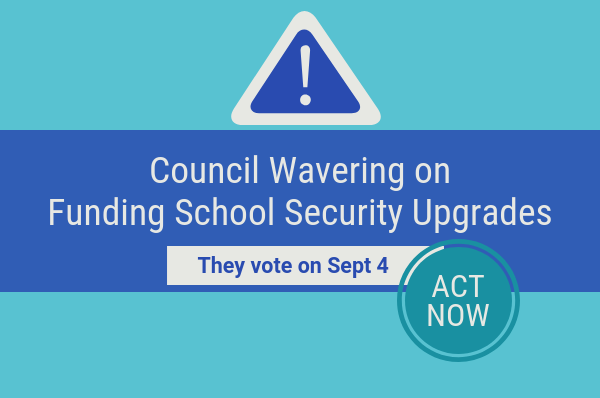 When CCPS went to the council in February to support their request to spend the fund balance, they assured the council that all school buildings are secure–every school is locked and visitors must be buzzed into the building. The schools identified are generally older and have not undergone a major renovation nor are they expected to undergo such a renovation in the foreseeable future. The need to fund projects explicitly for entrance upgrades is another symptom of the county’s decade of neglect. 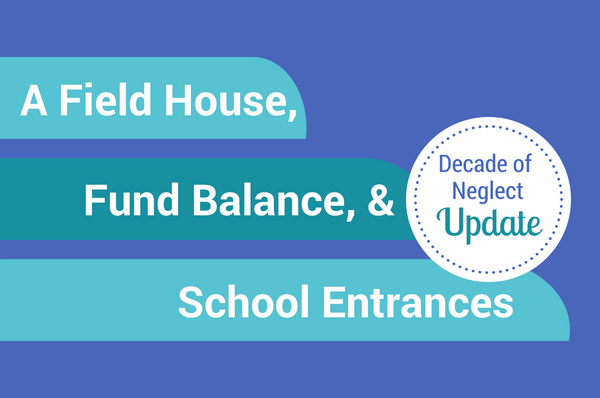 In the years before that decade multiple schools were renovated each year and features like upgraded entrances would have been a part of those projects. When the funding for major renovations dried up, so to did the opportunity to upgrade the entrances. Education is a large portion of the Cecil County budget so it’s understandable that the department is thoroughly scrutinized by both the county administration and the public. However, the scrutiny from the public often morphs into a handful of vocal yet uninformed residents hurling accusations intent on misinforming anyone who will listen. Choose your sources of information wisely. Jargon makes me crazy–mostly because it causes miscommunication if all parties in the conversation don’t understand the terms being used. Sometimes there’s no way around it so I want to explain some concepts so we’re all on the same page. Small capital–Funding for projects like systems upgrades that are too expensive to be covered in the operating budget and are generally only funded by the county. Large capital–Funding for major renovations and construction projects where the total cost is shared between the county and state. Fund balance–Money remaining in the operating budget after all other expenses have been met. I need to make this clear–funding a school system at maintenance of effort is the budgetary equivalent of the much-maligned participation trophy. In fact, state approval is required to fund below MOE. 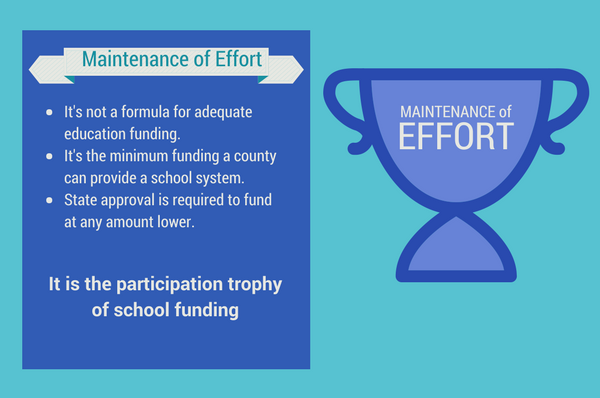 No one funding at maintenance of effort (or just slightly higher) is a champion of education. In my last article I shared my initial shock and disappointment with the county executive’s proposed budget for FY 2019. 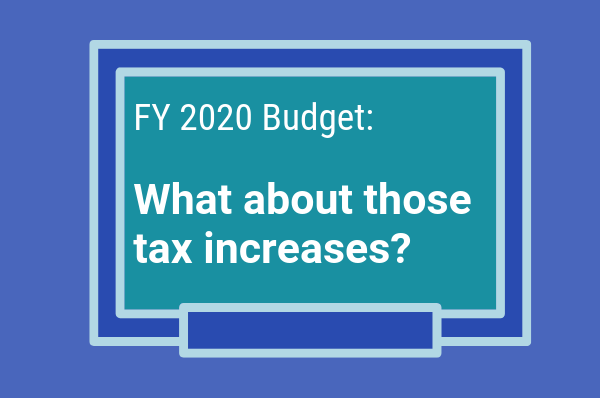 Now that I’ve explained some of the jargon, future articles will dive into questions that have been asked about the budget as well as questions that should be asked about the budget. 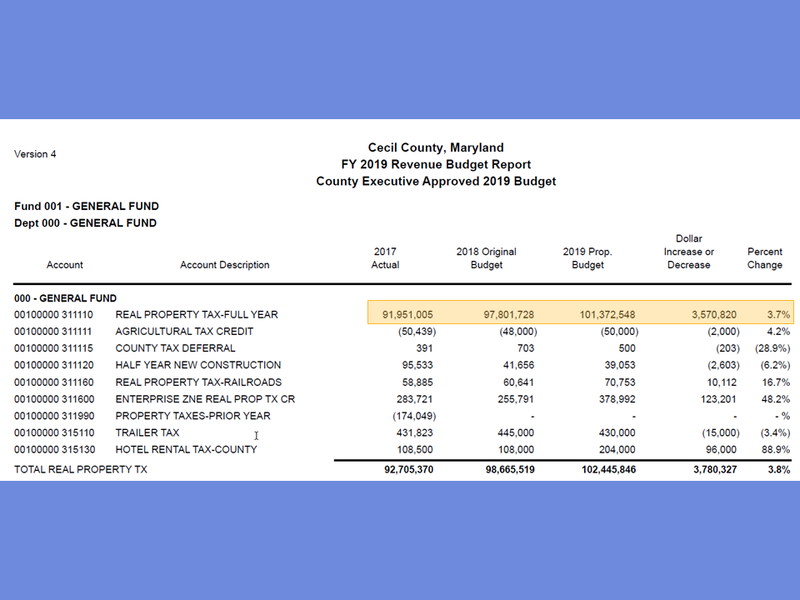 County Executive Alan McCarthy announced his proposed Cecil County budget for FY 2019 about two weeks ago. I’ve said little since that press conference because I didn’t know where to start and I knew once I started I wouldn’t be stopping any time soon. I suppose the one year honeymoon with the new county executive was fun while it lasted. But we can only expect so many magic tricks. 5 positions for social workers and psychologists to provide the services necessary to support the student population. Keep in mind that CCPS was forced to cut over 100 jobs several years ago when the county suddenly cut funding. 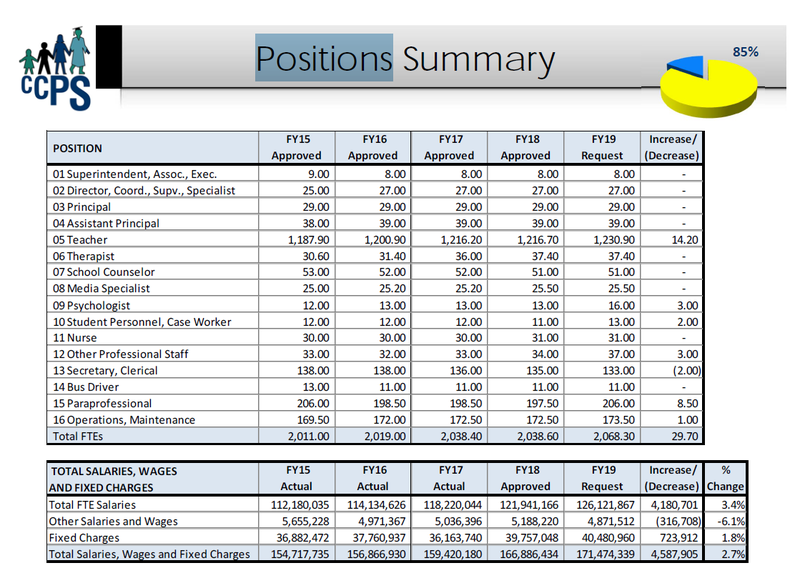 Notice that pie chart at the top of this page which shows the portion of the CCPS operating budget that is spent on salaries and benefits–85%. 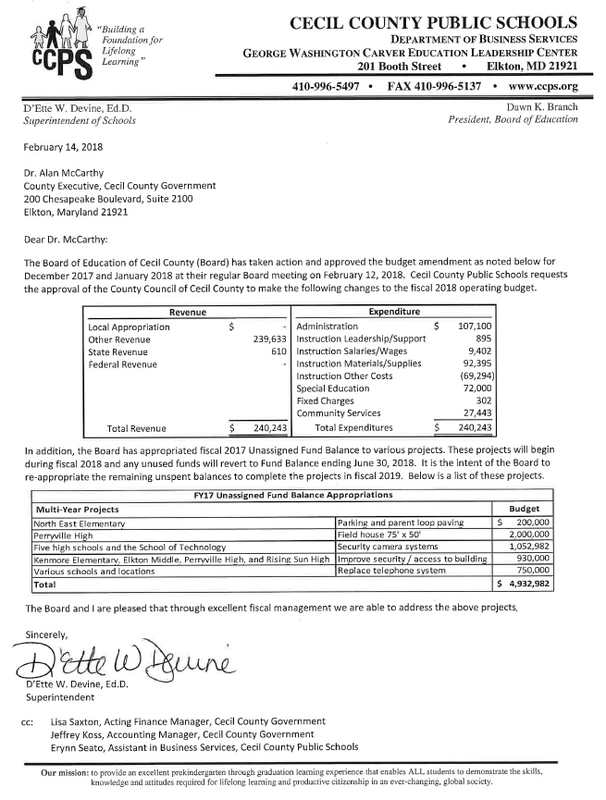 CCPS requested the lowest amount I’ve seen in the last 4 years at $3.76 million–yet the county only funded $1.76 million and $800k of that is a multi-year contract that they have to fund! Hmm, a difference of $2 million between the request and the proposed budget. That’s the estimated cost of the fieldhouse at Perryville High School. But I’ll talk about the fieldhouse later. Secure entrances at Leeds, Cecilton, Elk Neck, and Holly Hall Elementary Schools–in February, county government feigned concern over these projects and I called them on it then. Based on the county’s proposed budget, I was right. These projects include new school buildings, major renovations, and other expensive projects like new roofs and HVAC, the county’s proposed budget pushes every project except for the replacement school for Gilpin Manor Elementary which will be completed this fall and the roof replacement at Bo Manor Middle & High out an additional year or more. Chesapeake City Elementary replacement school–requested to start in FY20 and now pushed to at least FY21–originally built in 1939! North East Middle School major renovations–requested to start in FY20 and now pushed out past FY23–the building is so old it feels like you’ve stepped onto the set of Grease when you walk in the door. The building has been due for renovations for over 15 years. This is ugly and it’s only going to get uglier.